Early in their career, Black Sabbath released albums and launched tours at a breakneck pace. 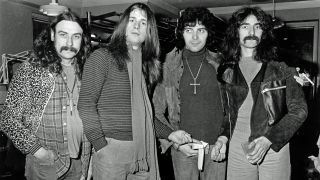 For a while the relentless record-tour-record cycle helped fuel their creativity – from 1970 though 1972, Sabbath issued four classic albums. These spawned numerous anthems: Paranoid, Iron Man, N.I.B., Sweet Leaf, etc. But when in the summer of 1973 the group tried to settle down and write their fifth album, guitarist/ songwriter Tony Iommi experienced something he’d never had previously – a wicked case of writer’s block. “What happened was we’d done Volume 4 in Los Angeles, and we had a house in the city,” Iommi recalls. “We all lived there. And everything was great on that album. Instead of jumping right back into the songwriting, the band took a little time off to recharge their batteries before getting back to work. But rather than rent an ordinary house to write and record, they had something else in mind. Blue Öyster Cult: "They wanted us to be the American Black Sabbath"
Musically, the song is comparable to past Sabbath classics, with its mammoth Iommi riff, and includes a musical trademark long associated with the band – merging a heavy section (‘You’ve seen life through distorted lies/You know you had to learn’, etc) with a lighter one (‘Nobody will ever let you know/When you ask the reasons why…’) – to create light-and-shade contrast. And harking back to such past compositions as Black Sabbath and Children Of The Grave, the song concludes with a long, instrumental jam section. Although the band would begin to fracture soon afterwards (due to drug abuse and burn-out), Iommi recalls that they were getting along quite well on both a musical and personal level around the time of the recording of the song. But there were a few odd ‘occurrences’ outside the band’s circle that happened during the recording. Released as the album’s lead-off single, Sabbath Bloody Sabbath was the first Sabbath song to have a promo shot to accompany it. In it, the group don’t mime the lyrics or fake playing their instruments – in fact they don’t even bother to pick up their instruments at all – as they waltz through what appears to be a forest. This was first published in Classic Rock issue 78.